Today, 17th Sunday of Ordinary Time, is also the feast day of Sts. Joachim and Anne, parents of Our Heavenly Mother, the Blessed Virgin Mary and with her we rejoice and thank God for having given us holy grandparents who were the instruments for bringing into the world and educating Our Lady to be the Mother of Our Lord Jesus Christ. IT IS A SPECIAL DAY TO THANK GOD AND TO PRAY FOR AND SALUTE ALL THE GRANDPARENTS AND THE ELDERLY IN GENERAL WHO HAVE SELFLESSLY TRANSMITTED THE GIFT OF LIFE AND OF FAITH TO THE SUCCEEDING GENERATIONS WITH THEIR LOVE, AFFECTION, WISDOM AND LIFE EXPERIENCE. THANKS TO THEIR SELF-GIVING, THE GIFT OF FAITH HAD BEEN HANDED DOWN FROM ONE GENERATION TO ANOTHER. IN MANY PLACES ALL OVER THE WORLD, THEY HAVE BEEN PROVIDING A CONTINUOUS AND INDISPENSABLE SUPPORT, IN SPITE OF THEIR ADVANCED AGE AND INCREASING PHYSICAL LIMITATIONS, TO PARENTS WHO ARE ABSENT DUE TO THE DEMANDS OF WORK AND MODERN LIFESTYLE. WITHOUT THEM, MANY CHILDREN WOULD BE DEPRIVED OF THE NEEDED LOVE, AFFECTION, COMPANY, AND EDUCATION. 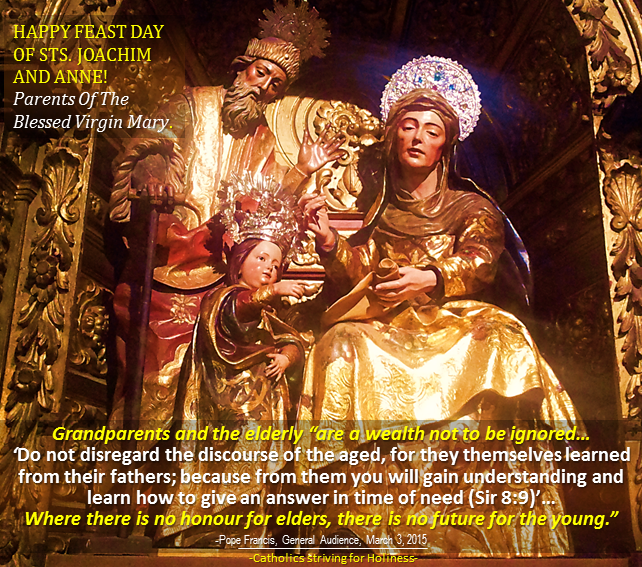 Through the intercession of St. Joachim and St. Anne, let us ask God for all the grandparents and the elderly so that they keep on providing the indispensable love, support and affection to their grandchildren with their prayers, faith, wisdom and holiness. Below is a vid I took during a July 26, 2017 visit to the Royal Parish of St. Anne (Seville, Spain) where I asked God through the incerssion of St. Joachim, St. Anne and Our Lady for all the grandparents and the elderly, especially for those who are sick, abandoned and lonely. Below you will find the 2 discourses of Pope Francis in his General Audience this year touching on the topic of the role and importance of grandparents in today’s world. CAPITALS MINE TO HIGHLIGHT IMPORTANT IDEAS. PHOTO MINE: St. Joachim, St. Anne and the Child Blessed Virgin Mary in St. Mary Magdalene Church (Seville, Spain).